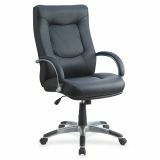 Lorell Stonebridge Leather Executive High-Back Chair - Executive high-back chair is upholstered in black leather with heavily stitched and tufted back and seat. 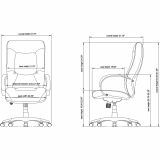 Back is tailored to provide good lumbar support. Loop arms are also upholstered in leather. Aluminum five-star base has plastic scuff guards and casters. Functions include pneumatic seat-height adjustment (19 to 22-1/2"), 360-degree swivel, tilt, tilt tension and tilt lock. 6-3/4" thick seat cushion size is 22-1/2" wide x 20-7/8" long. The 7-1/2" thick back cushion is 21-3/4" wide x 31-1/2" long. High-back chair meets the CA117 fire-retardant standard.